Global Textile Coatings Market size was worth over USD 5.1 billion in 2016 and will surpass 5,600 kilo tons by 2024. 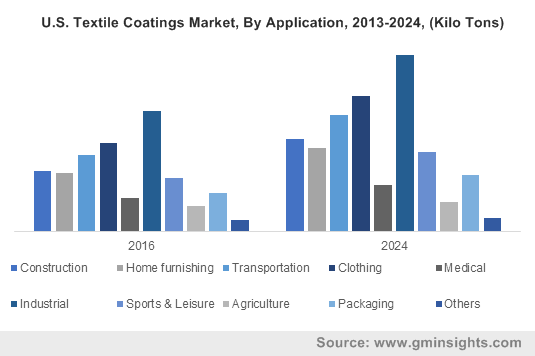 Potential outlook in construction, home furnishing, clothing, and medical industry will drive the textile coatings market size. Shifting consumer preference towards advanced products due to its benefits including fire retardation, anti-abrasion, anti-bacteria, self-cleaning and thermal insulation will fuel product scope. Rising product demand from construction industry particularly in China, India, Brazil and Southeast Asia will propel the textile coatings market. Global construction spending was over USD 4.5 trillion in 2016 and is estimated to reach USD 8 trillion by 2024. Expansion in global automotive industry coupled with inclination towards passenger cars will support the product demand. The global automobile sales were over 89 million units in 2015, which grew up to more than 93 million units in 2016. Commercial vehicles and passenger cars are widely used and have witnessed an increase in sales since past few years. Superior resistance to grease, heat, soil and water, along with scratch resistance are the key properties enhancing the product demand. Increasing investment on research and development to innovate fibre technologies, enhance moisture content, and repel water & heat to provide comfort will drive the demand. Textile coatings requires polyvinyl chloride, acrylic and polyurethane as raw material, higher demand of the material owing to various applications will affect the price trend. Competitive pricing owing to increasing production capacity particularly in emerging countries may further affect the price of the product. Textile coatings market is dominated by thermoplastics, accounting for over 80% in 2016. High application scope in architectural product, large tents, water proof clothing and banners will propel the product penetration. High requirement of product in manufacturing automotive airbags, bulk bags and leathers is expected to drive the overall business demand. Thermosets market will witness growth over 4% up to 2024. Natural, styrene butadiene, polyurethane and butyl rubbers are among the key thermosetting materials. Natural rubbers are widely used in rain wear, military suits, protective clothing and carpet backing. Rising demand for protective clothing from several end-use industries will propel industry growth. Traditional coating will surpass USD 2.2 billion by 2024. Competitive price along with the low setup cost required are the key factors supporting the business growth. Low cost application requirement mainly in rain wear products to improve water repellent properties will propel the industry demand. Large consumption of energy is due requirement of ovens for better applicability of the coat may hamper the segment growth. Advanced textile coatings are further segmented as plasma, magnetron sputtering and evaporation method. Advances techniques are among most widely used techniques with advantages over counterparts as robust design, large scale production and generation of anti-corrosion layer. Moreover, ALD techniques is widely used to create anti-microbial coating used in electrodes and medical applications. Construction industry was over 450 kilo tons in 2016. High adoption of hoardings & signage for advertisement and promotion particularly in emerging countries has enhanced the product development. Shifting advertisement trends towards hoarding & signage is among the major factor boosting the textile coatings market. Moreover, increasing product usage for architectural membrane, canopies and scaffolding nets will drive the overall industry demand. Home furnishing accounted over 12% of overall industry share in 2016. Strong product demand from carpet backing and sofa covers is expected to drive the overall industry growth. Increasing construction spending with rising trends for fabrics with easy washing and longer durability among residential and commercial usage will positively influence the product demand. Transportation application comprises for manufacturing automotive upholstery, airbag fabrics and tarpaulins. Increasing regulations regarding driver’s safety along with advancement in technology for avoiding accidents is expected to drive the overall industry growth. Moreover, superior properties over normal fabric with enhanced properties is will support the product penetration. Medical application is expected to witness robust growth over 4% by 2024. Abilities such as anti-microbial protection for extracorporeal devices and implantable & non-implantable devices required will support the product penetration during the forecast timeframe. Advancement in medical devices propel the textile coatings market. 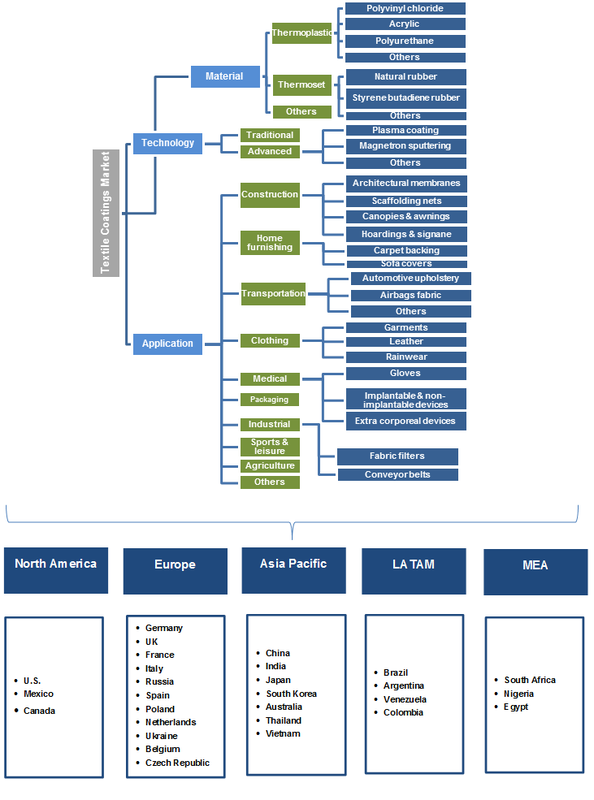 Asia Pacific is among the dominant region accounting more than 50% of overall market share. Constant demand from construction, transportation and clothing application will support the overall textile coatings market growth. Increasing disposable income with favourable policies boosting the industrial development will positively influence the product penetration. North America textile coatings market registered over USD 1.1 billion in 2016. Improvement in overall industry is expected to support the business growth. Stable raw material prices with stable energy pricing will propel the overall business growth. Increasing research and development spending among the industry players will propel the product penetration. Europe textile coatings market is projected to witness growth over 4% up to 2024. Germany, UK, Italy and France are among the key revenue generating countries owing to recovering automotive industry. Global textile coatings market share includes Huntsman International, Omnova Solutions, BASF, Solvay, Covestro AG, Clariant AG, Formulated Polymer Products, Sumitomo Chemical Company. The industry is highly fragmented due to presence of numerous regional manufacturers. Other notable players include Lubrizol Corporation, Tanatex Chemicals, Sioen Coating, DSM, Textiles Coated International, National Coating Corporation, Conversion Technologies International, Vintex, Ajy Tech India, Nobletex, Arville and Reagent. Increasing product portfolio along with increasing capacity are the key strategies implemented by business players. Textile coatings are flexible composite materials with polymers as dominant material aiming at providing products as per specific industry demand. Wide range of applications make the industry fragmented as per technique used for manufacturing. Better durability along with advantages over other counterparts is trending. Wide range of coated fabric application in both garments and technical textiles with flexible functionality will propel the overall market demand. Overall fabric industry is worth over USD 400 billion in 2016. Growing product acceptance in various applications will propel the textile coatings market growth.